Sal Litvak directed When Do We Eat? (Max Greenfield, Jack Klugman, Shiri Appleby, Lesley Ann Warren), a classic holiday comedy that became a worldwide Passover tradition, as well as Saving Lincoln, the the moving and visually unique tale of our 16th president. Sal's social media project, Accidental Talmudist, has a attracted nearly a million fans to his posts on Jewish wisdom, history and humor. Sal is an ideal speaker for any organization. With well over half a million fans at Facebook.com/AccidentalTalmudist, he can also help you promote your event. ​To schedule Sal for your event, screening, or Artist-in-Residence program, please contact us using the form below, indicating your projected dates and audience size. "The response to Salvador Litvak's Accidental Talmudist talk at Partners in Torah's Winter Retreat was extraordinary. Speaking to an audience of 400, he inspired, amused, elevated, and left a permanent impression on the religiously diverse crowd." 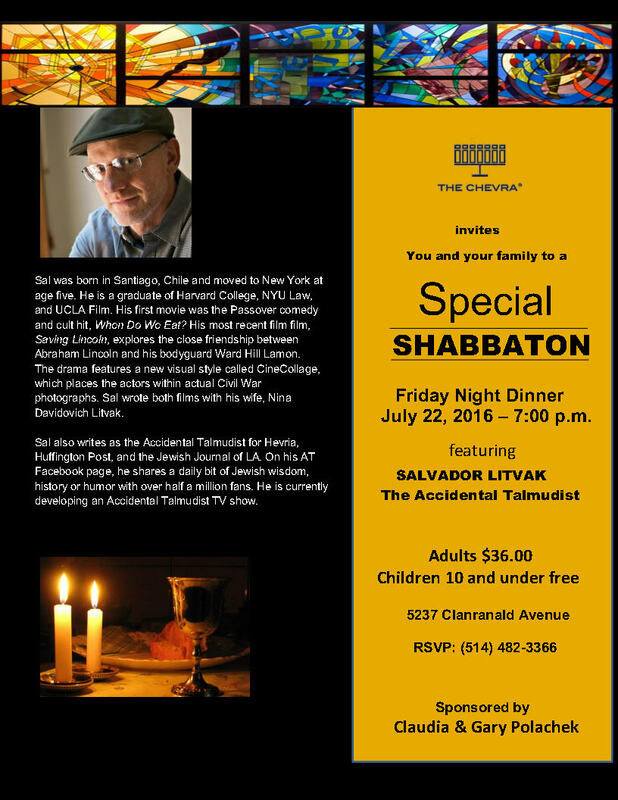 "Salvador Litvak is an enthralling speaker. The story of his Accidental Talmudist journey deeply impressed me, and the whole room, at the event I attended." "Sal was one of the most unique and inspiring speakers we've ever had. Our students loved An Evening With The Accidental Talmudist." "I had the privilege of hearing Salvador Litvak speak multiple times at a Limmud conference in Australia. He attracted a large crowd and captivated them with his wit, charm, and inspiration." "We’ve hosted many politicians, athletes, New York Times bestselling authors, etc. and without a doubt Sal Litvak was one of our best. Sal brings a passion that cannot be imitated or faked. He's also has a likable presence in the room. People gravitate towards Sal, and his message can give goose bumps." "Sal Litvak is as lyrical as he is substantive. He shares his personal narrative and his growth-journey with such a gift of story-telling and meaning-making that an hour can transpire and one feels that one is just in the beginning of something marvelous. He weaves autobiography with philosophy, links his personal story with the story of the Jewish people and humanity at large, and uplifts with his enormous sense of good will and hope for the future. He is a treasure, and everyone who can should expose themselves to him, his writing, his teaching, his speaking, his very being." "Sal is a very impressive individual with a powerful personal story. He engaged all who attended with humour, spirituality and deep meaning. Attendance was excellent for the organized events. I strongly recommend introducing Sal to your community for an evening or Shabbaton." How Do You Receive Torah?